In business, our natural instincts are always left-brained. We create tight arguments and knock the audience into submission with facts, fiqures, historical graphs, and logic....The bad news is that the barrage of facts often works against you. My facts against your experiences, emotions, and perceptual filters. Not a fair fight —facts will lose every time (emphasis mine). If your presentation does not connect, if you bore and are not memorable, then all your great data will likely be for naught. People have a tendency to over interpret their own personal and vivid experiences, and may ignore or be very skeptical of new information — no matter how scientific or objective — that is contrary to their current belief. Professor Richard Brislin (my graduate school mentor) of the University of Hawaii, touches on a very similar phenomenon in his book Understanding Culture's Influence on Behavior. In a section on theoretical concepts in intercultural communication, Dr. Brislin discusses why people make incorrect attributions or dubious conclusions in spite of evidence to the contrary. For example, let's say you read many reports in respectable periodicals that conclude Seattle is a very good place for young graphic designers to find high-paying jobs. Complete with this evidence, you begin sending off your resume, contacting companies, and looking into housing in the Seattle area. Later, while talking to one of your best friends, Lisa, and informing her of your desire to relocate to Seattle, she becomes practically apoplectic. "What?" she says. "My brother has a design degree from Berkeley and has been up in Seattle for over a year without finding a full-time design gig!" Lisa then goes on to tell her brother's horror story in Seattle. So now you have the word of one friend vs. loads of factual, detailed documented information which runs contrary to your friend's opinion. Who do you believe? Citing early work by Sherman, Judd, and Park (1989) on social cognition, Brislin suggests that it is highly likely we will be more persuaded by our friend's testimony, which was surely more colorful, emotional, and vivid compared to the reading of labor reports in periodicals. Also, I would say that the fact Lisa is "telling her story" about her brother makes her information memorable. So what does this have to do with presentations? Two things: (1) As presenters, we have our work cut out for us. Our audiences bring emotions, experiences, biases, and perceptual filters that are no match for data and facts alone. And (2) we must not make the mistake of thinking that our data can speak for itself, no matter how convincing, obvious, or strong it may seem to us. We may indeed have the best product or best research, etc. But if we "plan" a boring, ego-centric, "death by PPT" snooze-fest, we will lose. The best presenters target both the logical left and the emotional right. The audience, after all, is comprised of human beings, is it not? Non-verbal communication is an important and large part of our presentation. And clearly our facial expressions are a key channel of nonverbal communication. If this is so, then why do we insist on turning the lights off when we turn on the projector? How can people see our facial expressions (gestures, body movement, etc.) if all they can see is a screen? As Bob Smith (Director of Technical Services for the Stanford Center for Innovations in Learning) points out on his well-written blog, it probably is just an "odd learned behavior." Ten years ago, projectors were not all that bright, so turning the lights off made more sense. Today, even the smallest business projectors are typically 1200-1500 lumens, which is usually bright enough for a smaller venue or teaching situation. There is no good reason for turning off the lights today in most situations. Yes, dimming, sometimes, but only then if you feel the detail of the image is just too important to miss. In this case you can dim the lights while you explain the image, and then turn up the lights again when you are done with your close examination of the slide. Habit is clearly another reason presenters turn off the lights. As I have said before, it is common in Japan for someone — motivated by politeness — to turn off the light switch just before a presenter begins his PPT presentation. "Projector on/ lights off" is considered common sense. But this practice is not only unnecessary today, it goes against what we know about effective communication and the need for presenters and audiences to engage and connect. It is near impossible to connect, engage, and persuade if the audience and presenter can not see each other. Using annotated PowerPoint slides as "handouts"
Depending on the situation, a handout — or "takeaway" — is a very good thing to distribute at the end of your talk. If you have a detailed handout of your material, you will not feel compelled to cram every slide full of reams of detail. The details after all are coming out of your mouth; the visuals support your talk. Presentations are dynamic, so perhaps you did not come to an important point in your presentation due to time constraints? If you included that point in your handout, you at least can refer to that before you close. The best handout will be written as a separate document. But often we do not have time for that. In this case, if you annotated your slides in the notes view during the building of your presentation, you can simply go back and edit them, expanding when necessary, and clean them up for better reading. Printing out annotated slides may not be the best answer to the handout-creation dilemma, but this kind of handout will be much better than simply printing out a deck of bulletpoint-filled slides which are often impossible to decipher clean meaning from. And of course, if your slides were visuals only (usually the best use of PPT), they would have little meaning without either your narration or a clear written description and elaboration of your point. 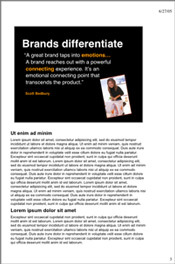 Download sample_notes.pdf of an old presentation I did many years ago. You can see how I made a printable PDF in PowerPoint with the notes and slide both visible. If you have Acrobat Pro, you can get the file size way down. This file is a bit large since I made the PDF right within the OS. The key to doing well in a presentation is all in the preparation. If you prepare well, edit like crazy, and really get your story down pat — down well enough to pass the elevator test — then you really can tell "your story" well in any situation. A friend of mine, Jim in Singapore, sent me an email this week sharing a good example of what can happen if you really work hard to know "your pitch" or "your story." Dear Garr...got this new prospect and have been trying to get in front of the guy for months. Finally get the word he'll see me next week. Great news, now what's my point? I know he is a super short attention span guy so I used the beyond bullet points 5 minute template and agonize over the content and graphics. I want this guy to have a Tom Peters "wow" moment. Well we get to the office and begin with the usual small talk that starts a meeting and suddenly I realize we've gone over the points of the presentation in our conversation and he has agreed to move forward. Then looks at his watch and says great to see you thanks for coming in. As we walk out of the building the two guys that work for me say hey you never even pulled out the presentation and he still bought the deal – that was great! Meanwhile I'm in a complete funk: "What about all my pretty pictures?" "He never even saw my presentation. What a waste of time putting the whole thing together!" Later that night I told my wife the story and told her how disappointed I was and she looked at me kind of funny and said, "but you accomplished what you wanted to accomplish and have a new client." Then the light went on. 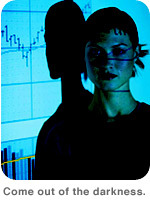 Presentation preparation is about organizing thoughts and focusing the story telling so its all clear to your audience. I was able to articulate the points because I had worked those through in the preparation of the presentation. Even the graphics had made me think the presentation through and became a part of the presentation even though the audience never saw them. Beyond Bullet Points is hard work to really get it but it is really paying off. An excellent point Jim makes here. If you prepare well, the preparation process itself should help you really know your story. Kind of like in college when we filled out all those 4x5 cards with exam notes...and then never really looked at them since the process itself of writing, organizing and editing really helped us get the material down and internalize it. If we prepare a slide presentation well, we should be able to still tell our story if the projector breaks 5 minutes before the presentation....or if the client says "the heck with the slides, just give it to me straight." Love to hear from you if you have an example of ditching your slides in favor of a conversation, whether planned or not. 7% of meaning is in the actual words spoken (verbal). 38% of meaning is in the way words are spoken, e.g., loudness (vocal). 55% of meaning is derived from what we see e.g., facial expressions (visual). The data is often used in an over simplified way, no doubt. But for practical purposes, it does not really matter if the verbal accounts for 7% or a slightly greater number. What is important to remember — and this seems quite intuitive in fact — is that a huge part of our message in a stand-up presentation is being conveyed nonverbally. Far more than most people realize. Yes, great content is paramount. But content (verbal) is a necessary condition but not a necessary and sufficient one. Presenters must pay close attention to how they present their material (visuals, dress, room, props, handouts, voice, etc.). If the content (verbal) were everything, then one could just read the entire presentation from a manuscript, head down in a monotone voice without much vocal inflection or any eye contact. And this effort would probably be a waste of everyone's time. People are by their nature inclined to pay close attention to nonverbal cues, even if they are not conscious of this. According to the authors of Why Business People Speak like Idiots, "...human beings are hard-wired to draw much more meaning from people than they are from the information that people present." Absolutely spot on. A classic example that the authors point out to illustrate the importance of visual communication is the 1960 Nixon/Kennedy televised presidential debates. This debate was broadcast live on both TV and radio. Nixon was not feeling physically well the day of the debates and looked tired, pale, and had bouts of perspiration. But Nixon was a smart guy and held his own in the debate. In fact, people who listened to the debates on the radio (verbal, vocal) judged Nixon to be the winner of the debates. However, people who watched the televised version (verbal, vocal & visual) said Kennedy — the younger, handsome, perspiration-free candidate — won the debate. The visual mattered then. And it matters now. The important thing to remember about Mehrabian's study is not the actual percentages, but simply that there is no question about it: the visual and the vocal are at least as important as your content, perhaps more so. Certainly the visual and the vocal aspects are something that are not given enough attention judging from my own experience and the loud complaints from the business world about the "Death by PowerPoint" syndrome. How not to speak like a "business idiot"
While killing time between flights in an SFO bookstore, I picked up a copy of this book: Why Business People Speak Like Idiots : A Bullfighter's Guide. I highly recommend this book to all business people (or students about to launch their careers). At 177 pages it is a quick read and stuffed with information, stories, and anecdotes from the front lines of business that will make you laugh, and shake your head in both agreement and disbelief. According to the authors, there are basically two kinds of people: (1) people who speak clearly, directly, simply, and from the heart, and (2) smart people who nonetheless obfuscate, bore, and confuse by "speaking like idiots." The book even includes a glossary of typical BS words used by "business idiots" such as "center of excellence" or "best practice." OK, inspired by the book, here's a little test I made to help you determine your business communications IQ (or should that be EQ?). "How can we repurpose our results-driven strategy for scalability and a maximization of best-practice, frictionless, future-proof alignment moving forward?" (A) "Excellent question, boss! Let me interface with my people off-line for cross-departmental buy-in and I will ping you later. By the way, that is a world-class tie you are wearing!" (B) "Let me drill down and link up with the first movers in the org to come up with a killer value proposition for all the stakeholders. By the way, that is a real best-of-breed necktie you are wearing!" (C) "Well, this kind of paradigm shifting, outside the box thinking will require some more bandwidth. I will cross-check with our mission critical repurposing agenda and see what kind of game plan we can go-live with A-Sap. Hey, new tie? Kool!" If you chose (D) then chances are you are already well on your way to becoming a clear, effective communicator. Congratulations! This book is not specifically about presentations (and certainly not PowerPoint), but its messages apply to presentations, memos, emails, meetings, or any other kind of interpersonal communication in a business context. I made a ton of notes in my copy and will be sharing bits of the book from time to time. Although the authors are from Silicon Valley, I do not know them personally. So trust me when I say that this is one book every business professional will want to read this summer. Excellent stuff. 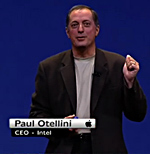 President and CEO of Intel, Paul Otellini, took the stage from host Steve Jobs during the WWDC keynote (discussed below) and had about 10 minutes to explain briefly why "Apple & Intel" was not a crazy idea. Mr. Otellini did a fantastic job of it. You can watch his short presentation if you scroll to the 48:00 minute mark in the QuickTime of Steve Jobs' keynote. Mr. Otellini begins by stating that the best way to make his point is by telling a story. He then goes on to tell the story of two, great Silicon Valley companies. Many people may think that Intel and Apple teaming up is akin to Luke Skywalker joining the darkside. But as Mr. Otellini demonstrated, the match is not only mutually beneficial now but that the relationship actually goes back four decades to the beginning. In fact, Intel was an early investor in Apple. Yes, the competition was very heated over the years, but here in 2005, and looking far off into the future, the Apple/Intel partnership combines two giants with complementary strengths, according to Mr. Otellini. If you are going to be a leader, a CEO for example, then you need to be able to stand and deliver a great presentation. A great example of a business leader who knows how to present to large audiences is Steve Jobs. The reason I like Jobs' presentation style so much is because he is not a professionally-trained presenter, he is just a business man sharing information and telling his story. The lesson we can learn from Jobs' style is not "to be like Steve," but rather to be ourselves. Jobs is speaking to 3000 people in the room and thousands more streamed live. Yet, his style is informal, relaxed, friendly, and personal. He is able to connect and to entertain while all the while remaining professional. His style is fantastic and very effective. Watch Steve Jobs' June, 2005 WWDC keynote here in QuickTime. Our speaking can not always be perfect in a presentation — we are human after all. But our slides do need to be perfect. One small error that appeared in Steve's slides twice was the incorrect use of an opening quote instead of an apostrophe for the abbreviation of "2006/2007. This is a very common oversight and by no means a deal breaker, but it was surely noticed by many. It was more important that the punctuation be correct in this case since it was only the apostrophe that visually told us it was "July, 2006" nor "July 6th." The date not the year usually appears below the month in this type of flip-page calendar. This is a small thing and did not detract from his presentation. But for us — regular business people presenting to skeptical audiences — every detail matters. Ironically, I found that MS Word for Mac automatically flips a single opening quote into an apostrophe after numbers if you do not close the quote. Keynote does not do this automatically. Can presenters learn from Star Wars? OK, I am back from my Hiatus to the USA. I was in Oregon primarily on family business, but did get to both the Apple head office in Silicon Valley (CA) and the Microsoft main campus in Redmond (WA) for brief meetings. The blog will be updated regularly during the summer, so please come back often. 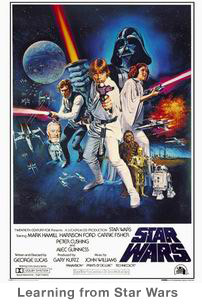 During my time in the USA, I watched Star Wars Episode 3. With my interest in Star Wars rekindled, I proceeded to watch the entire six episodes of Star Wars on DVD over the next week (hey, I was on vacation!). Frankly, the prequels just do not match the original episodes of my youth, but at least Revenge of the Sith does bring us back to the beginning, to the "real Star Wars." The most interesting part of the DVDs, however, are the documentaries and commentaries, many featuring George Lucas himself. I was in awe as I learned more about Lucas' ideas and his approach. As I learned more about the incredible creativity (and hard work) behind Lucus' creations, I felt that we mere mortals can learn so much about business presentations (which are essentially opportunities to "story tell") by listening to master story tellers like Lucas. One key idea often discussed in the Star War documentaries, was the importance of editing like mad to get the story down to about 2 hours. To do this they scrutinize every scene to make sure that the scene — no matter how cool it may be — actually contributes to the story. If during the editing process a scene is judge to be superfluous, it will be cut. They seemed very keen on keeping to the 2 hour format, they said, as this was in the best interest of the audience. We have all seen scenes from movies that left us scratching our heads wondering just how it contributed to the story. Perhaps the director felt the scene was just so technically cool or so difficult to make that he just could not stand the thought of not including it in the film. But that would be a bad reason to include a scene, of course, wouldn't it? As far as presentations go, we also have all seen people include data or facts, or graphics, etc. that just did not contribute to the speaker's overall point (which we were probably at a loss to find anyway). Presenters often include superfluous items because they are perhaps "proud" of their work and want to "show it off" even if it really did not help support the speaker's particular point. Moral of the story: Always keep the audience in mind by (1) keeping it as short as you can and still do an effective job "telling your story," and (2) after you have prepared your presentation, go back and edit like crazy, eliminating parts that are not absolutely crucial to your overall point or purpose of the talk. This website has some very interesting discussion on story telling and Star Wars.